WASHINGTON -- Asif Mohiuddin first learned he was arrested from a TV news report. Mohiuddin and his sister, Juela Zebunnesa Khan, had gone to the police detectives' headquarters on April 3 in Bangladesh's capital, Dhaka, for questioning by authorities. They were told that he was not being arrested. But around 3:00 p.m., as they caught sight of a TV screen, they were stunned to see the breaking news tickers announce that Mohiuddin had been arrested. "I did not leave him for a moment since morning, and he was answering detectives' questions. Detectives repeatedly told us they did not have any plan to arrest Asif. How could the news make any sense?" Khan told The Huffington Post. 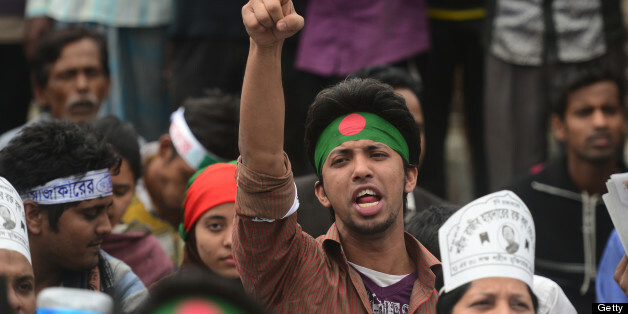 It was not until two hours later that Mohiuddin, a self-declared "atheist," was arrested. He was the fourth of the so-called "atheist" bloggers taken into police custody since April 1 in the country for writing articles that Islamist fundamentalists found defamatory. The arrest came as Mohiuddin was recovering from wounds he suffered in an attack allegedly carried out by Islamist fundamentalists in January. Mohiuddin has stayed in jail since then, with his requests for bail repeatedly turned down for reasons unknown to his family and lawyer. Family members say Mohiuddin grows weaker and sicker every day, as his wounds -- which required 56 stitches to close -- get worse. After complaining about neck pain for the past nine weeks, Mohiuddin was finally tested on Thursday, and surgery may soon be required. "Doctors had warned after the assault against a possibility of him embracing physical disability if not treated timely and properly. But the arrest came all of a sudden, even before the doctor-advised time of three months of bedrest was over," said a helpless Khan. Mohiuddin had a fever the last time Khan met with him Wednesday, she said. Mohiuddin told her at times his hands and head go numb, and he's unable to feel anything for a while. But the Bangladeshi mainstream media, which was quick to report on Mohiuddin's arrest, seems to have lost interest in the blogger. A controversy in the country over "atheist" bloggers was coined by a Bengali-language national newspaper called Amar Desh. be. In its article, Amar Desh labeled the writers as "atheist," and called upon believers to protect Islam from the hand of these writers smearing the religion and its prophet. The paper was honing in on bloggers working as part of the Shahbag movement, which began in early February of this year with online activists calling for the execution of war criminals from the country's 1971 war of independence. Those who have been convicted are leaders of Bangladesh's largest Islamist party, Jamaat-e-Islami. Amar Desh is owned by a former bureaucrat, Mahmudur Rahman, who is loyal to the political coalition to which Jamaat belongs. Rahman was also arrested -- a month after the bloggers were -- for inciting unrest. When that happened, the heads of 15 news outlets railed against the government for cracking down on "freedom of expression" and "free journalism." They demanded immediate release of the arrested editor, but mentioned nothing about the other journalists -- the four bloggers -- who were also incarcerated. "This is not journalism, rather showing journalism your back. Journalism means publication of information in a responsible way even if the information relates to the absolute truth," said Kaberi Gayen, an associate professor at Dhaka University who teaches mass communication and journalism. After several of the country's mainstream media outlets demanded Rahman's release, several newspaper editors from other publications decried the nation's media, calling it biased. "Who is more responsible? Should it be a blogger expressing his opinions on blog that has limited access to people, or the newspaper republishing the bloggers' opinion [in a] provocative manner, enraging tens of thousands of believers?" Gayen asked. Gayen said she believes that the standard Bangladeshi journalism maintains is to serve its own political and corporate allegiances. "We must question the political intention of a particular newspaper when it publishes a blog opinion piece in mainstream media provocatively to incite its tens of thousands of readers," said Gayen. Politicians in Bangladesh have been known to exploit religion as a means of holding on to power. Gayen said the communal unrest that followed Amar Desh's report about the bloggers only served politicians. This is not the first time the Bangladeshi media has come under fire. Years of underreported extra-judicial killings by the Rapid Action Battalion, globally known as the Bangladeshi death squad, have made clear the level of self-censorship in the country's press. The documentary "Fear, Force and Fabrication," produced in 2011 in Dhaka, also shed light on how the media and RAB work together in the country. Bob Dietz, the Asia Program Coordinator at the Committee to Protect Journalists, bluntly told The Huffington Post that Bangladeshi media is viewed with "deep concern" by the organization. "The media -- be they newspapers or bloggers -- are highly politicized, especially in light of the recent events surrounding the war crimes tribunal," he said. Several bloggers who spoke with The Huffington Post said the mainstream media's definition of "freedom of expression" in the country means having an atmosphere that allows them to sell politicized information uninterrupted. That is why, they argued, the arrest of the bloggers has meant nothing to the press. "They [the media outlets] actually control freedom of expression by means completely under their control," said Rasel Pervez, one of the three "atheist" bloggers just released from jail. "They decide which opinion is worth publishing, and then find out the writer who can serve them the best." Disclosure: The author of this post was involved in research for the documentary "Fear, Force and Fabrication."